Sports have been an efficient way to bring people together, and more than anything, it has been a way for individuals to rise up – through their success on the field of play – as demigods, worshipped by fans of their team. This is a culture that has been in existence since the beginning of time and Australian Rules Football is not exempt from this culture. One of its ‘demigods’ is Dustin Martin, a professional player who has been in the sport since he joined in 2010. Today, he is one of the most celebrated names in Australian football and Australia as a whole. Learn more about him by reading below. If there is one thing that has been true when it comes to sports, it is the fact those who end up writing their names in the hall of greatness have been playing the sport since they were a child. Their body goes through the formative stages with the stress and knowledge of the sacrifice that will eventually make them champions. 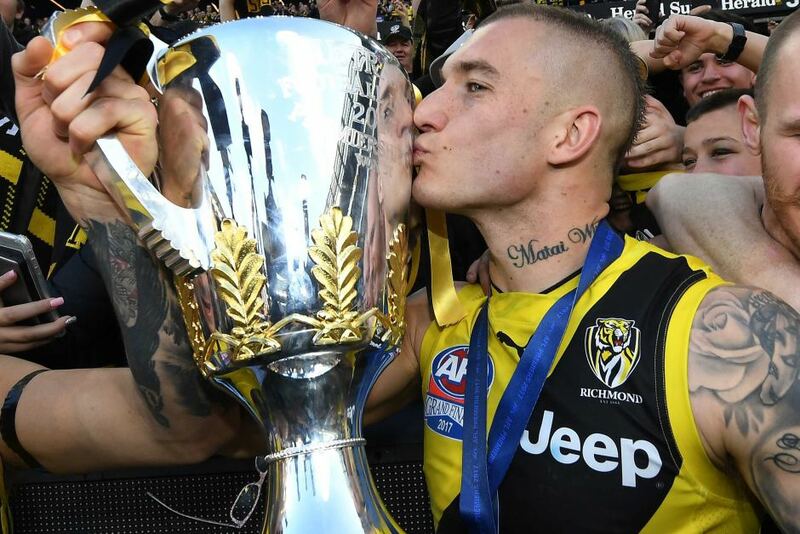 Dustin Martin, who is a certifiable champion began playing Australian football in 1997, six years after he was born on the 26th of June 1991 to Shane Martin and Kathy Knight in Victoria, Castlemaine. Dustin was raised along with two brothers, Tyson and Bronson, both of whom he grew up playing football with. His passion for the sport at such an early age placed him in a junior team, Campbell’s Creek before he spent some time at Bendigo Pioneers. The perfect family in which he was raised was shattered at the age of 14 when his parents got separated. With the children in a position to choose what parent they want to live with, Martin chose to be with his father in Sydney. His relocation to Sydney from Victoria put an end to his education. He began to work in his father’s transport company, combining it with his football career, having joined Ingleburn Magpies under-16 team in Sydney, and then later to Campbelltown Football Club. After a year in Sydney, Dustin Martin returned home to Victoria where he rejoined Bendigo Pioneers and his dream of becoming an Australian Football League player came true in 2009. Having been on the radar of several AFL teams as a result of his performances for the Bendigo Pioneers, he eventually signed with Richmond in the 2009 AFL Draft. His first season as an AFL player was in 2010 and despite an initial struggle to life as a professional player, he delivered enough to be named in the 2010 AFL Rising Star award. After the acclimatization period of his first season, Martin grew into life as an AFL player, becoming one of the most important players in the Richmond team and in the AFL. This growth continued all through his seasons with Richmond. He won the Premiership in 2017 and started the 2018 season as the best player in the Australian Football League. Some of his accolades, which are extensive include being named three times into the All-Australian team in 2016, 2017 and 2018. He won the Brownlow Medal in 2017 and the Norm Smith medal in 2017. He has also won the Jack Dyer Medal twice. Dustin may have just spent one difficult year with his father following the separation from his mother, but he has maintained a close relationship with his father, Shane Martin. His father, who is a New Zealander also played football briefly for two teams, Harcourt and Kangaroo Flat. After years in Australia, which he arrived in at the age of 21, Shane Martin was deported back to his home country. Dustin Martin regularly visits him in his home in Auckland. The rest of Dustin Martin’s family – mother, Kathy Knight, and his two brothers are very much still alive and well. Not much information is available about them but it is believed they have a good relationship with Dustin and are proud of his exploits on the football pitch. Who is Dustin Martin’s Girlfriend? Despite what has been an often controversial lifestyle outside the pitch, there are little confirmations regarding his dating life. As for his relationship, he is rumored to be dating model, Elissa Burns. While there haven’t been confirmations from either party, both have been regularly found taking trips together with a source close to both parties announcing that they have, in fact, been dating since March 2018.